In China students take Deer Velvet while studying for exams. There is widespread belief that it improves mental capacity. What many Westerners don’t know is that as well as being a physical tonic, this valuable natural supplement may also be a powerful tonic for the mind. Research has shown that the mental capacity of students improved significantly when they were given a Deer Velvet extract prior to a mathematical test. In a further test, students were asked to make specific editorial correction to text before and after consuming either a control solution, or a dose of Deer Velvet extract. There was a significant increase in the number of corrected signs amongst those who took the Deer Velvet, despite the fact that both groups increased their level of performance from the first to the second test. A phospholipid found in Velvet, along with improved circulation and an increased availability of neuro-transmitters to the brain are thought to be responsible for the benefits in mental function. 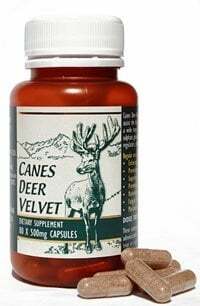 Canes Deer Velvet may be just the brain food needed to give the memory a boost as exam time approaches, or perhaps you just feel your everyday mental function could do with a lift. From the archives of the Deer Industry New Zealand’s issues of ‘Vitality’, which reports on NZ Velvet Antler.